At only 0.97 x 0.97 inches small, the LC_XO is the smallest true GPS-Disciplined-Oscillator (GPSDO) on the market today. The LC_XO was designed to be soldered onto a customer PCB or plugged into a standard 100-mil pin-spacing DIP socket for optional retrofitting. The LC_XO is designed for high-volume, low-cost production applications. 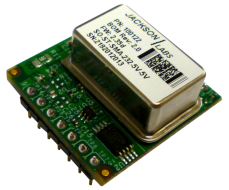 It provides all the software features of the larger Jackson Labs Technologies, Inc. GPSDO such as full SCPI command support, NMEA output support, a WAAS/EGNOS/MSAS 50-channel GPS receiver, a 10MHz and 1PPS input and 1PPS output, and is field-firmware-upgradable. The LC_XO is available in either OCXO or TCXO versions and represents the smallest SWAP GPSDO on the market today. Phase noise and frequency stability are not compromised, and the unit achieves a -155dBc/Hz noise floor with better than 5 parts per trillion frequency stability over 5 hours of operation. The unit includes internal 3.3V to 5V DC-DC power supplies and filters, and can provide 5V at up to 50mA to external customer circuitry, as well as to the external GPS antenna. The unit provides ALARM/EVENT/LOCK status signals in TTL format as well as serial format and has a dual LED on board for status indication.